SPECIAL ORDER ONLY! 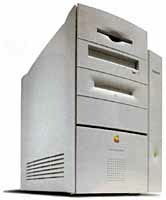 Economy Power Macintosh G3 MiniTower features a 300MHz (optimized 266, tested) PowerPC 750 (G3) processor, VRAM: 2 MB (expandable to 6MB), built-in 64-bit 2D/3D graphics accelerator, in an easily expandable tower case. These units have 160 MB ram, 6GB EIDE Hard Drive, 24X CD. Uses EIDE and SCSI drives internally and externally with proper cabling This one can use all of your SCSI peripherals! 10 BT ethernet built in. Floppy built in, and two serial ports. You can still use your LaserPrinter or other Mac serial printer and other older hardware. OSX Jaguar 10.2.8 capable with additional ram installed (larger hard drive recommended). These units are Headgap Systems refurbished. We thoroughly clean each unit and perform over 50 tests. Complete with manuals (.pdf) and free Kitchen Sink CD (a $9.99 value). Mouse and or Keyboard available this section. AVAILABLE UPGRADES (phone in orders): Add Internal 100MB Zip - $40, Upgrade VRAM to 6MB - $22, Add a Firewire Card - $20, Add 100baseT Ethernet - $20, Add 56K Internal Modem - $20, Add A/V Card - $50, Add 256MB Ram - $40, Install OSX 10.2.8 w/CD's - $79. OUR $449.77 includes domestic shipping. Sell us your old one. SPECIAL ORDER ONLY. Ship us your unit to rebuild. Power Macintosh G3 Desktop features a 266MHz PowerPC 750 (G3) processor, VRAM: 2 MB (expandable to 6MB), built-in 64-bit 2D/3D graphics accelerator, in an easily expandable desktop case. These units are upgraded to 256 MB ram, 4GB EIDE Hard Drive, 24X CD. Uses EIDE and SCSI drives internally and externally with proper cabling This one can use all of your SCSI peripherals! 10 BT ethernet built in. Floppy built in, and two serial ports. You can still use your LaserPrinter or other Mac serial printer and other older hardware. OSX Jaguar 10.2.8 capable with additional ram installed (larger hard drive recommended). These units are Headgap Systems refurbished. We thoroughly clean each unit and perform over 50 tests. Complete with manuals (.pdf) and free Kitchen Sink CD (a $9.99 value). Mouse and or Keyboard available extra this section. AVAILABLE UPGRADES (phone in orders): Add Internal 100MB Zip - $40, Upgrade VRAM to 6MB - $22, Add 1000baseT Ethernet - $20, Add 56K Internal Modem - $25, Add A/V Card - $50, Add 256MB Ram - $40, Add a Keyboard - $20, Add a Mouse - $29.99. $349.77 domestic shipping included. (We can refurb your old unit call). Limited Quan. Sell us your old one. We are buying Beige G3 Desktops and MiniTowers. Have an old unit sitting in the closet you are no longer using. We pay shipping and cash for working G3's. They need to be intact and at least powering up. We thoroughly erase any media. Don't let these end up in landfills. Call or Email your info.